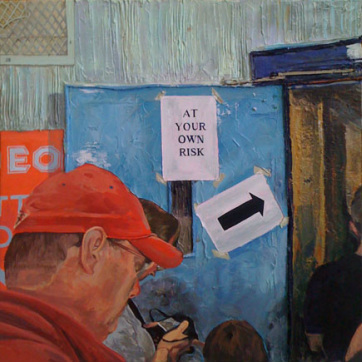 I had always envisaged “Last Chance for Screen Three” as part of a series of paintings. With the October 2013 one-man show booked in at the Eagle Gallery, I thought that I would have a small bit of wall space dedicated to these texture paintings. With this in mind a group of four would look good, and so three more were required which I produced concurrently. “At your own risk” was the second one completed although I had always seen this reference image as the follow-up, if I was ever to do more than one. It was adapted from a grainy i-phone photograph, which I had taken in the remains of the old Odeon cinema in St. Albans on an open day to promote the new Oddysey cinema. It depicts people queuing to enter the main auditorium, weirdly dressed like tourists. I assume many of those visiting this day were local people who had grown up going to the cinema or maybe like me had an interest in cinemas and especially dis-used ones. The image appeals to me because I feel it works as a composition but also because it shows different eras concurrently. The grill at the top left may be an architectural detail surviving form the 1930’s while the Odeon “Litter Point” graphic and other decorations are from the late 1980’s when the cinema closed. In front of all this are strange transient humans visiting fleetingly in 2011. Everything co-existing at this instant. I’ve tried to stick with the same language as “Last chance for Screen Three” as in the building itself is textured using modelling compound while the figures and detail are flat canvas. I’ve also used strips of cardboard to define the door and door frame. The bottom left figure comes across as quite flat, but I like this, and feel there is enough interest in the image as a whole.